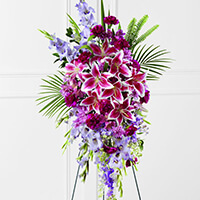 Provide comfort for the family of Zelma Armstrong with a meaningful gesture of sympathy. Zelma Bernice Armstrong, 91, of Olathe, KS passed away Dec. 30, 2018 at Good Samaritan Society of Olathe. Celebration of Life will be 2:00 to 5:00 pm Sun., Jan. 6th, 2019 at the Tumbleweed Saloon Bar and Grill, 615 E. Main St., Gardner, KS 66030. Memorial contributions may be made to the Good Samaritan Nursing Home. Arrangements: Bruce Funeral Home, Gardner, KS (913) 856-7111. Zelma was born July 17, 1927 in Hammond, IN to Jesse Benjamin and Ethel Lucille (McNess) Chandler. She was a 53 year resident of the area. Zelma married John Richard Armstrong on May 6, 1946 in Seattle, WA. She worked at the Tumbleweed, volunteered at Meadowbrook Rehab. Center, enjoyed monthly luncheon outings with friends, loved to watch her great-grandkids basketball games and loved to cook. Zelma attended the Antioch Family Worship Center and belonged to Illiana Lucky Wheels Motorcycle Club. She will be dearly missed by family and friends. She was preceded in death by her parents; and husband, John; brothers: George. Clyde, Lester, Paul and Robert Chandler; sister, Thelma Chandler. Zelma is survived by her daughter, Sharon and husband David Meyer, Green Valley, AZ; son, John R. and wife Barb Armstrong, KCMO; sister, Helen Byrom, Irmo, SC; Ted Chandler, Adairsville, GA; eight grandchildren and thirteen great-grandchildren. Tumbleweed Saloon Bar and Grill 615 E. Main St. Gardner, KS 66030 2:00p.m. - 5:00p.m. We encourage you to share your most beloved memories of Zelma here, so that the family and other loved ones can always see it. You can upload cherished photographs, or share your favorite stories, and can even comment on those shared by others. Her sister Helen, Keith, Cheryl and family sent flowers to the family of Zelma Bernice Armstrong (Chandler). We loved you and will miss you especially your sister. Her sister Helen, Keith, Cheryl and family purchased the The FTD Tender Touch Standing Spray for the family of Zelma Armstrong. I am sorry for your loss. May the words at Revelation 21:4 bring you comfort during this difficult time.